Hidden away, deep within a forest in central Africa, is something quite special. But the Pollia berry's name doesn't quite do it justice, because this thing is shiny. Damn shiny. In fact, it's the shiniest living thing in the world. These fruits, which look a bit like something you might hang on a Christmas tree, owe the title to their microscopic physical structure. In fact, it might shock you to hear that they contain no blue pigment whatsoever. 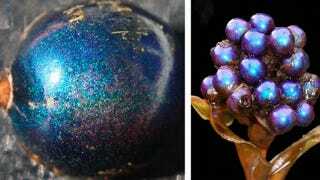 The surface of the berries is actually made of four layers of thick-walled cells, each layer itself containing more layers made of cellulose fibers. All those fibers run parallel in their own layer, but crucially the layers are all slightly rotated relative to each other, forming a spiral when you look from the top down.